The upmarket Vignale offers a very different spin on the Ford Mondeo ownership experience. A more personal service and some mouthwatering trim and equipment choices make this a bit of a treat. It's time to sit down, settle back and hit the 'way back when' button. We'll rewind back to a time when the Carrozzeria Ghia SpA was one of the real heavy hitters of the Italian styling business. That was back in the Fifties, with the company working with VW on the Karmann Ghia and Volvo on the lovely P1800. By the mid-Sixties, Ghia was in trouble and was at one point owned by De Tomaso, eventually ending up being snapped up by Ford. Seeing some value in the name, Ford decided to make the Ghia name its top trim level. Soon we started to see all sorts of sorry Orions and Escorts bearing this once proud name. Giacinto Ghia must have been rolling in his grave. Well, Ford's at it again. For Ghia, swap in Vignale. This is another Italian coachbuilder who fell on hard times, the company once owned by De Tomaso. Ford bought the name in 2013 and will hopefully treat it with more respect than it gave to Ghia. The first vehicle that gets the Vignale treatment certainly looks the goods. 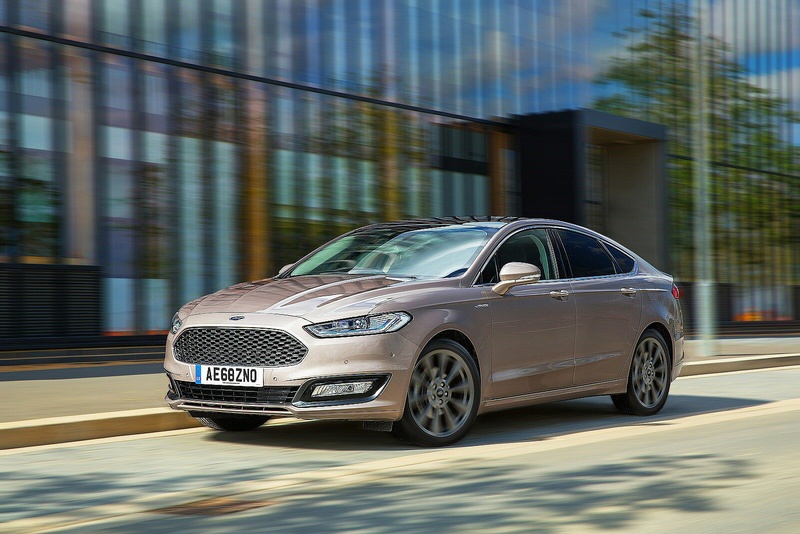 The Vignale Mondeo offers a buyer experience you probably never reckoned on from Ford. This top Ford is sold with the more powerful engines from the Blue Oval brand's stable, which means you get to choose between 150PS and 180PS versions of Ford's EcoBlue TDCi diesel units, as well as the 187PS petrol-electric hybrid powertrain. Go for the faster diesel unit and you get PowerShift automatic transmission and the option of Ford's intelligent all-wheel drive system. There's been a huge effort devoted to increasing refinement in the Vignale models. 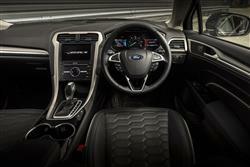 Ford's innovative Active Noise Cancellation system enhances interior refinement. Using three cabin microphones, the system is able to monitor engine noise in the interior. Advanced audio technology directs opposing sound waves through the audio system to cancel out engine noise and improve cabin ambience. Acoustic glass helps reduce wind noise to levels normally experienced only in the premium segment. Ford's integral link rear suspension claims to offer a smoother ride, in particular for rear seat passengers. The engineers also reckon that this set-up reduces noise levels by allowing the wheels to move further rearwards on impact with uneven road surfaces. Although the silhouette is recognisably Mondeo, the Vignale's design details are worth a closer look. The upper grille features a hexagonal design in dark matt metallic finish and finished with a polished aluminium surround. There's also a high-gloss lower grille with chrome bars, chrome door details, a high-gloss finish for the windshield pillar and for the central and rear window pillars. Special 18-inch Vignale alloy wheels and an exclusive Vignale Nocciola paint finish are also offered. On to colour. Metallic paint comes as standard, with further options including Vignale Black, Vignale Silver and premium four-coat Vignale White. 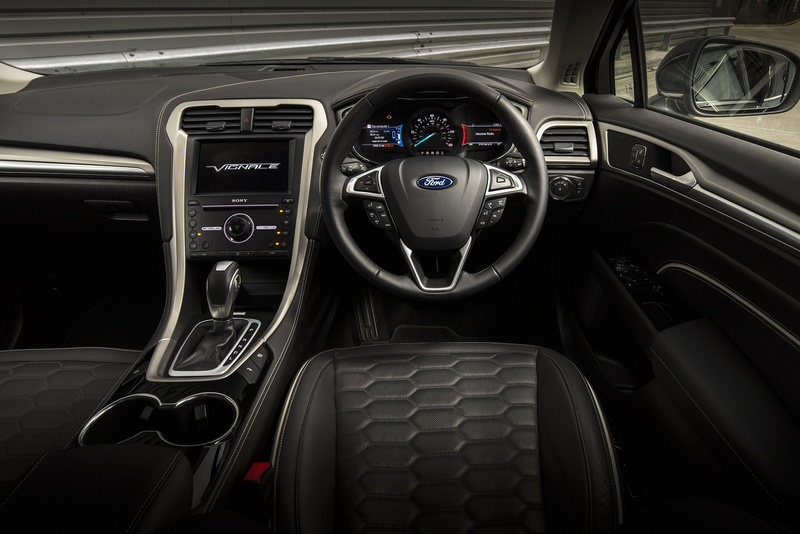 The interior looks a cut above, with seats are offered in exclusive Vignale leather trim. Laser-cut for high precision, the material features hexagonal quilting and tuxedo stitching with soft-touch elements that extend to the instrument panel, centre console, arm-rest, and door top-rolls. For front seat passengers, comfort can be optimised by Ford Multi-Contour Seats with Active Motion massage function. Designed to reduce muscle fatigue, particularly during longer journeys, the seats use a system of 11 inflatable cushions to deliver an unobtrusive massaging effect for thighs and lower back. The Mondeo Vignale is offered in both four-door and estate body styles with prices starting at around £28,500. Bear in mind that this is within £3,000 of an entry-level Jaguar XE and you'll appreciate the scale of Ford's task here. Mind you, the ownership experience is quite special. Each Ford Vignale model is hand-finished by six master craftspeople at the new state-of-the-art Vignale Centre in Valencia, where vehicles are individually tailored to customer specification. Exclusively available to order in the UK from boutique FordStore locations, customers get access to a Vignale Lounge, where they can specify their vehicles, supported by a dedicated relationship manager to ensure a personalised service tailored to individual needs. Among bespoke services available to customers will be collection and delivery for vehicle servicing - from a home address or office location - alongside servicing scheduled to suit the owner. Buyers will also be able to call upon knowledgeable Vignale OneCall advisors 24 hours a day for additional support. Most British buyers are going to be drawn to the 180PS 2.0-litre diesel powerplant, and rightly so - it's a great engine. Paired to an auto gearbox, it returns 52.3mpg on the combined fuel economy cycle, with emissions of 142g/km. Step down to the 150PS version of this engine with a manual 'box and you're looking at around 58.9mpg and 124g/km. The hybrid version is good for 58.9mpg and 108g/km. A bigger concern might well be depreciation. These are the most expensive 'mainstream' models Ford sells and it's up for debate whether many will see value in a £30,000+ Mondeo. Still, over 70% of all Mondeo buyers order their cars in upscale Titanium or Titanium X trims, so we're prepared to be proven wrong. 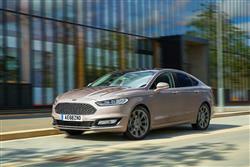 If the Vignale can account for 10% of all Mondeo sales, the project will be deemed a success. If you�re looking for a new Ford Mondeo Vignale 2.0 Hybrid 4dr Auto Hybrid Saloon for sale, you�ve come to the right place. At Bristol Street Motors we don�t just have the best Ford Mondeo Vignale 2.0 Hybrid 4dr Auto Hybrid Saloon deals, we also offer friendly advice and help with all your enquiries to ensure your buying experience is a happy experience.